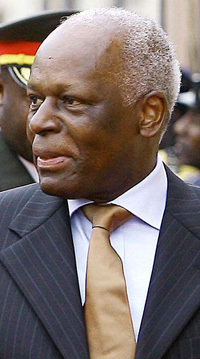 Angola established the official diplomatic ties with South Korea on Jan. 6, 1992. South Korea opened its embassy in Angola on July 7, 1992. Mr. Han Jae-Young is currently serving as its ambassador. At the Angolan Embassy in Seoul Charge d'affairs Alfredo Dombe is serving as its head of mission. The mutual cooperations particularly business areas have been on steady increase since then. The bilateral trade volume reached 443,000,000 US dollars in 2009. Angola exported to South Korea 118,000,000 US dollars worth of goods including iron and copper products, crude oil, and fishery products. Angola imported from South Korea 325,000,000 US dollars worth of goods automobiles, oil products, industrial machinery as well as offshore platforms and structures. A growing number of South Korean businesses are in operation in Angola to getting ready to advance into the African country. More than 60 corporations from South Korea advanced into the African country now. They include Daewoo Shipbuilding & Marine Engineering Co. (DSME), Inter-Burgo (Fisheries), Hyundai Heavy Industries, Samsung C&T Corporation, and NamKwang Engineering & Construction. Currently some 500 South Koreans are living or working in Angola. The figure includes over 400 employees of NamKwang Engineering & construction. NamKwang is constructing LNG (liquified natural gas) tanks, hotels, and other buildings in Angola. Recently South Korea's Daewoo Shipbuilding & Marine Engineering Co. (DSME) secured an order from Chevron to construct an offshore platform for oil and natural gas production, valued at around 510 million US dollars. The 18, 758-ton offshore platform to be built at DSME shipyard in Okpo on South Korea's Geoju Island will be delivered to Angola in 2013. For details or inquiries contact the Angolan Embassy in Seoul at 792-8463.